Platinum is one of the most precious metals you will find in the world; the metal is considered to be extremely rare, strong and durable making it the preferred choice for use in diamond jewellery. South Africa is known for containing the world’s richest platinum reserves, which are situated in the North West Province. The country is home to 80% of the world’s platinum production, yet it wasn’t until Shimansky pioneered the use of the platinum in jewellery in South Africa that platinum jewellery was available to the South African market. Platinum is a fairly new metal to the world of jewellery design; the metal only started to gain popularity in the 19th century and was only recently used to mount diamonds on engagement rings. Even though platinum is considered to be a 'new' metal, its history dates back to the ancient Egyptians and Pre-Columbian Indian civilisation. During this period, platinum was considered an extremely important metal. In recent history, the fascinating metal was discovered in 1557 by the Italian-French physician, Julius Caeser Scaliger while he was visiting Central America. It was only until 1590 that Spanish Conquistadors found platinum in the rivers of Equador while looking for gold. Back then, they were not aware that the white metal was in fact, platinum and named it platina, which means ‘little silver’. The metal was then thrown back into the river in order for it to turn into silver. In the 18th century, platinum made its way through Europe and shortly after became an interest amongst scientists, who found the metal's special properties extremely fascinating. For example, the properties intrigued scientist Swedish assayer, Scheffer in 1751, who proclaimed the precious metal as the seventh element at the time. Scheffer's fascination with the metal then led to him being the first scientist to successfully melt platinum. During the late 1700s, the first to obtain pure platinum was French physicist P.F. Chababeau, who made a chalice that was presented to Pius VI. The King of France, Louis XVI was so convinced with the properties of platinum that he proclaimed platinum to be the only metal fit enough for royalty. In the early 1800s, British chemist W.H. Wollaston obtained a pure sample of platinum; his techniques to separate the PGMs (the six platinum group metals, platinum, palladium, rhodium, osmium, ruthenium and iridium) is still used up until this day. Other techniques to produce the metal was, however, only introduced in the 19th century. In WWII platinum was prohibited due to the metal being a strategic material. During this period, the demand for platinum was suppressed for decades. It was only until recently that platinum made a strong resurgence as a popular metal for jewellery. Today, the production of platinum still remains a delegate process. The reason? Platinum only melts at an extreme boiling point of 3190 degrees Fahrenheit or 1755 degrees Celsius making the metal extremely difficult to work with. It requires expert skill and a wealth of experience to craft platinum into fine jewellery creations. This led to Shimansky becoming the platinum pioneers and top specialists of the world. CEO and founder, Yair Shimansky started the platinum revolution in South Africa and in jewellery making. But how exactly did he come across the precious metal? During a business trip to the US Shimansky noticed that platinum was starting to make waves abroad. It was during that time that he came across the unique qualities of platinum; the metal is noble, it’s hypoallergenic, it’s pure and it goes perfectly with a diamond. With most of the world’s supply coming from South Africa it was the perfect match for Shimansky; the relationship between the two led to Shimansky being one of the world’s top platinum specialists. Not only is platinum considered to be one of the strongest and most enduring metals, but it’s also extremely rare. 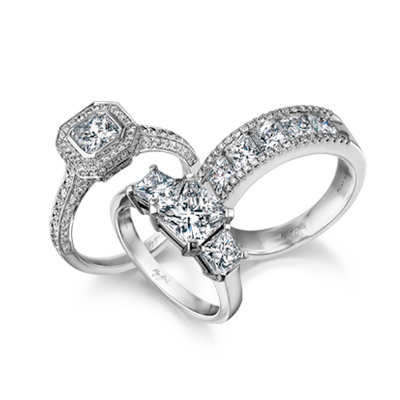 In addition, it’s also the perfect choice for diamond engagement rings as it doesn’t wear off in colour. The one of a kind metal symbolises rarity, love, strength and purity, just like the love of your life.